Two of the Iditarod's winningest mushers and one of Alaska's most decorated Native sports athletes are the newest members of the Alaska Sports Hall of Fame. Martin Buser of Big Lake and Jeff King of Denali Park, both four-time Iditarod champions, and Nicole Johnston of Anchorage, whose Native sports career resulted in several records and more than 100 medals, lead the Class of 2017 that was announced Wednesday. — The 1988 solo winter ascent of Denali by mountain climber Vern Tejas. — The Fur Rendezvous Open World Championship Sled Dog Race. "The inductees represent classically Alaskan sports," Hall of Fame executive director Harlow Robinson said. "It's a group of household names in our state that have been in the discussion for induction for many years." The group represents the 11th class for the Hall of Fame, which celebrated its inaugural year in 2007. The date for the 2017 induction ceremony will be announced later, Robinson said. To date, 35 people, 16 moments and 11 events have earned spots in the Hall of Fame. Buser has won the admiration of fans for his success, for the way he takes care of his dogs and for showing strength and joy in a personal life that has often played out in public. He won Iditarod titles in 1992, 1994, 1997 and 2002. In 2002, his team won in a record time of 8 days and 22 hours — a mark that stood for nine years. He has won the race's coveted Leonhard Seppala Humanitarian Award an unprecedented five times. Voted on by veterinarians, the award goes to a musher who demonstrates outstanding dog care along the 1,000-mile trail. Following his record-setting run in 2002, Buser — who was born in Switzerland — became a U.S. citizen in a ceremony conducted under the famous burled arch that marks the Iditarod finish line in Nome. Three years later, he had to have part of a finger amputated after a woodworking accident that happened four days before the start of the race. He finished 13th that year, and after the race his competitors awarded him both the Sportsmanship and Most Inspirational awards. In the summer of 2015, Buser provided temporary shelter for about 200 sled dogs that were displaced by the Sockeye wildfire near Willow, about 20 miles from Buser's Big Lake kennel. A few months later, and about six weeks before the 2016 Iditarod, Buser was back in the news when his son was critically injured in a multicar accident in Seattle. Buser and wife Kathy Chapoton rushed to Seattle, leaving their other son Rohn home to keep training the family's sled dogs. 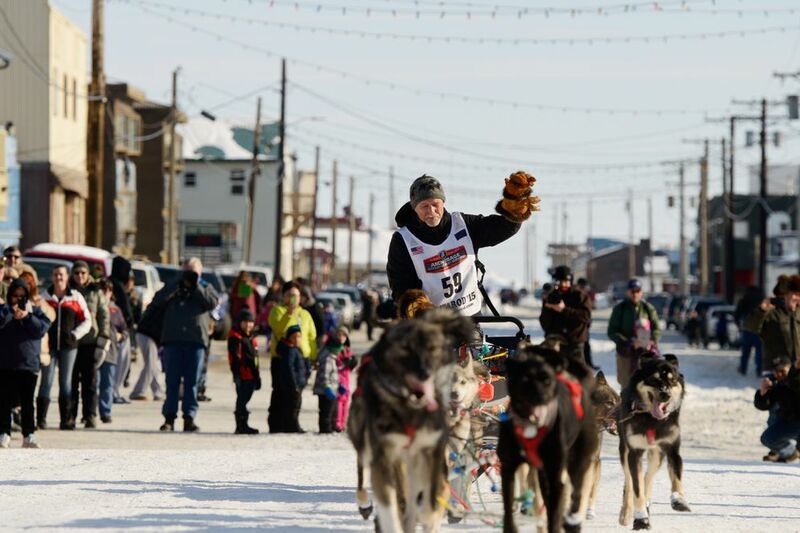 Buser returned to Alaska in time to extend his record streak of Iditarod finishes to 31 straight (Nikolai was hospitalized until early April and continues to rehab). As a nod to Buser's love of Alaska and the Iditarod, both sons are named after Iditarod checkpoints. A winner and an innovator — that's Jeff King. He is one of mushing's winningest dog drivers, and one of its most creative. Besides Iditarod championships in 1993, 1996, 1998 and 2006, King has won the Kuskokwim 300 a record nine times, and in 1989 he won the Yukon Quest, one of only three mushers to win both of mushing's 1,000-mile races. King boasts more than a dozen titles in shorter races in Alaska and the Lower 48, a list that includes two Copper Basin 300 wins, three Tustumena 200 wins and the 1999 championship of Wyoming's Rocky Mountain Stage Stop race. He has introduced a number of innovations, some that didn't catch on and some that have become widely used. King attached wheels to his sled in 1994, but the move was banned by the Iditarod before he got a chance to try them in the race. Twenty years later he came up with the trail-dragger sled, a sled with a seat that became a top sled design. Last year, he figured out a way to make it recline. He has revolutionized towlines and harnesses, and he has experimented with new ways of summertime training, letting his dogs swim as a form of cross-training and one year trying out a hypoxic device he developed to simulate altitude training. In her prime, Johnston was a threat to win almost anything at the World Eskimo-Indian Olympics. From the spectacular jumping events that show off athleticism to the endurance events that test pain thresholds, Johnston did it all. For a quarter of a century, Johnston held the world record in one of the most epic events in Native sports — the two-foot high kick. 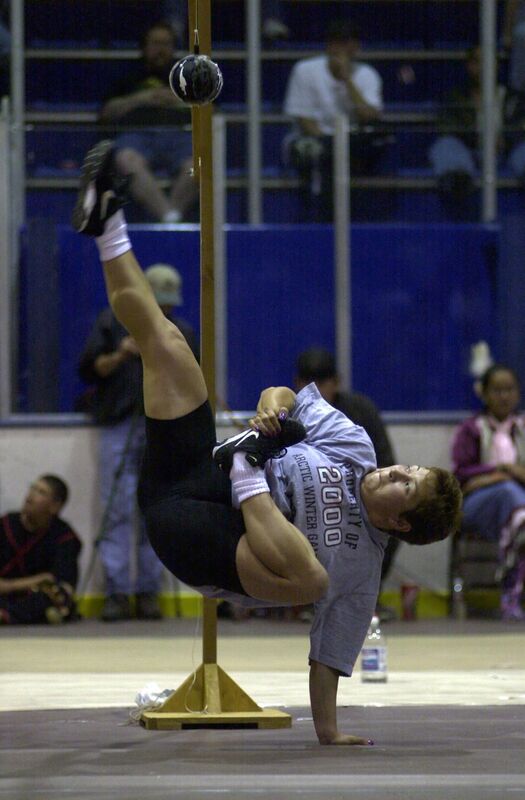 She set the women's record of 6 feet, 6 inches in 1989 and didn't surrender it until 2015. From the two-foot high kick to the kneel jump to the ear pull and more, Johnston excelled. She collected more than 100 medals at major events like WEIO, the Arctic Winter Games and the Native Youth Olympics. She learned the games while growing up in Nome and expanded her Native sports resume as an adult in Anchorage by becoming a board member and eventual chairwoman for WEIO. Under her direction, WEIO ran smoothly and on time — a huge accomplishment for the sprawling, weeklong event. Johnston is perhaps Alaska's biggest ambassador for Native sports. She has traveled around the state teaching the games to children and teens and is the lead official at the Native Youth Olympics. "McKinley storm keeps Tejas' condition unknown," blazed a headline from the March 15, 1988, edition of the Anchorage Daily News. Mountain climber Vern Tejas had reached the summit of North America's tallest peak a week earlier. But to become the first person to make a successful solo winter ascent of 20,310-foot Denali, Tejas had to climb down the mountain. Alaskans waited with bated breath for news of his descent. They knew getting to the top of Denali is just half the battle. Four years earlier, Japanese adventurer Naomi Uemura made it to the top but disappeared on the way down, and his body was never recovered. Conditions worsened after Tejas left the summit, where he planted a Japanese flag in memory of Uemura. Strong winds whipped up snow and made it impossible to see, forcing Tejas to dig a trench at 10,000 feet, where he hunkered down for three nights. He had a radio with him, and one day he heard a news report about his climb: No one knew where he was. For an entire week, no one heard from Tejas, who endured 60 mph winds and minus-90 temperatures during the climb. When the weather finally cleared enough for him to continue his descent, he got socked in again at basecamp and had to hunker down for a couple of more days. Once the weather cleared, Tejas skied to the airstrip and carved 20-foot high letters in the snow: "OUT." Soon, a plane piloted by Lowell Thomas Jr., who had dropped off Tejas off a month earlier, flew into view. Tejas waved, Thomas landed, and the two men headed to Talkeetna. 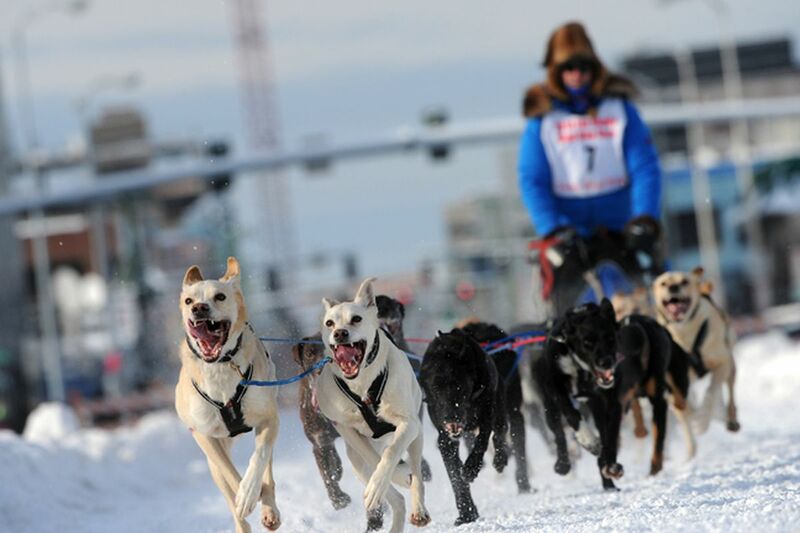 The centerpiece of Anchorage's annual Fur Rendezvous, the Open World Championship Sled Dog Race is three days of sprint racing on the streets and trails of Alaska's biggest city. Dogs run through the heart of the city as they make the 25-mile round trip between downtown Anchorage to Far North Bicentennial Park. 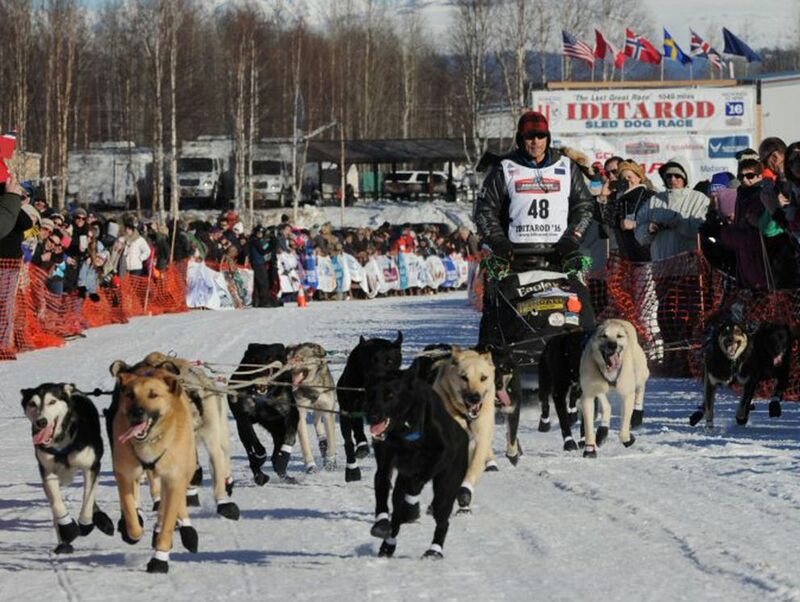 The race dates back to 1946 and was voted "Best Event" by the International Sled Dog Racing Association. Its storied history includes the intense rivalry between George Attla Jr., an Alaska Native from Huslia, and Roland "Doc" Lombard, a veterinarian from the East Coast, whose duels electrified fans during the 1960s and 1970s. The race showcased early mushing legends like Gareth Wright and Earl Norris. After the Attla-Lombard era, Roxy Wright and Charlie Champaine dominated the race, and more recently sprint stars Egil Ellis and Buddy Streeper have reigned. The race is so integral to the Fur Rondy festival that last winter, when there wasn't enough snow to race on the traditional trail, organizers created a 2.5-mile strip of snow so teams could race a 5-mile loop from downtown to Mulcahy Stadium. It wasn't an Open World Championship race, but it put sled dogs on the streets for three days during the Fur Rondy festival, whose organizers realized a Rondy without sled dogs wasn't really a Rondy at all. Beth Bragg is a member of the Alaska Sports Hall of Fame selection panel. Selections are based on the votes of nine panel members plus a 10th ballot based on online public voting. Correction: An earlier version of this story incorrectly stated that Jeff King was the first musher to win both the Iditarod and the Yukon Quest. Joe Runyan was the first.